Defense Secretary Jim Mattis listens during a hearing of the House Armed Services Committee on Capitol Hill, Feb. 6, 2018, in Washington. 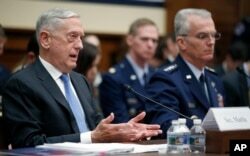 Defense Secretary Jim Mattis castigated Congress on Tuesday over its failure to pass a budget establishing military spending levels for the fiscal year that began in October. Political bickering in Washington led to a partial government shutdown last month, hours after Mattis outlined a new strategy for dealing with threats to the nation and the resources needed to address them. Mattis testified before the House Armed Services Committee on the need for a fully funded military budget in order to carry out his strategy, and he again spoke ahead of a potential shutdown. A stopgap funding measure expires at midnight Thursday. If no spending agreement is signed into law by then, nonessential government operations will be suspended for the second time this year. "I ask that you not let disagreements on domestic policy continue to hold our nation's defense hostage," Mattis told the committee. "We all know that America can afford survival." Mattis warned that his job in President Donald Trump's Cabinet, which he said was "keeping the peace" and "giving diplomats time to solve crises through diplomatic channels," was not possible without the money to modernize and sustain America's military. "Money at the time of crisis fails to deter war," he told lawmakers. "We need you to pass a budget now." Defense Secretary Jim Mattis, left, accompanied by Joint Chiefs Vice Chairman General Paul J. Selva, speaks during a hearing of the House Armed Services Committee on Capitol Hill, Feb. 6, 2018, in Washington. His comments came hours before the chamber was set to vote on a budget bill. That bill proposes another temporary funding measure for most of the federal government, but would fully fund the Defense Department with $700 billion for the remainder of the fiscal year. The bill is expected to pass the House, but it could be blocked in the Senate by Democrats who oppose passing military spending without including nondefense domestic spending. Mattis said that without proper funding, the military would need to change its strategy to accept greater risk and would continue to lose its advantage on every military front. Republican Representative Mac Thornberry of Texas, the House Armed Services chairman, called Mattis' testimony the "bluntest" and "most direct" warning he had heard yet on the need for a budget. Democratic Representative Adam Smith of Washington state, the ranking member of the committee, told Mattis the government was already $21 trillion in debt and needed a budget that could "fit" with the country's overall needs. Some of the Defense Department's budget additions will be used to update the military's nuclear capabilities. "Nuclear weapons pose the only existential threat to our nation," General Paul Selva, the vice chairman of the Joint Chiefs of Staff, testified alongside Mattis on Tuesday. "Therefore, there is no higher priority for the joint force than fielding all of the components of an effective nuclear deterrent to deter potential adversaries from nuclear attack on any scale." Beyond modernizing the nuclear force, a new policy, known as the Nuclear Posture Review (NPR), will add low-yield, or less powerful, nuclear weapons to the submarine-launched cruise missile arsenal and bring back the nuclear sea-launched cruise missile. 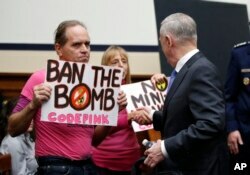 Defense Secretary Jim Mattis, right, shakes hands with Medea Benjamin of Code Pink, a peace and social justice activist group, as he arrives for a hearing of the House Armed Services Committee on Capitol Hill, Feb. 6, 2018, in Washington. Mattis said Tuesday that the sea-launched missile could provide new leverage for U.S. diplomats trying to persuade Russia to end alleged violations of the 1987 Intermediate-Range Nuclear Forces Treaty between the U.S. and then-Soviet Union. Russia denies the allegations. The treaty dealt with the elimination of their intermediate-range and shorter-range missiles. "The idea is, once again, to keep our negotiators negotiating from a position of strength," Mattis said. According to the State Department website, the treaty required the "destruction of the parties' ground-launched ballistic and cruise missiles with ranges of between 500 and 5,500 kilometers, their launchers and associated support structures and support equipment within three years" after the treaty entered into force. Officials have said the addition of low-yield weapons will counter Russia's perceived belief that it could use its own similar weapons against the United States in a limited "first-use" basis that would give Moscow an advantage in a low-level conflict without causing a U.S. nuclear response. Some critics have pointed to these two additions in the Nuclear Posture Review as unnecessary for deterrence. Others warn they could make a bad situation worse should a new arms race arise. "It's dangerous bordering on insanity to think that we could control escalation once a nuclear weapon was used," Alexandra Bell of the Center for Arms Control & Non-Proliferation told VOA. "Whether it's China or the United States or Russia, all countries need to be sitting down around a table and talking about how we can avoid a situation in which any country thinks it can get an advantage by using a small nuclear weapon," she added.